Your order has been processed and you will be receiving your DVD's in the mail. Please Contact Me Soon to set up your Personal Life Coaching Session. We are on our journey now to start your transformational process. This is about taking action in your life in order to start the process of change. I am here to help you achieve mastery to reach your highest potential in life, physically, mentally and spiritually. You will be able to listen to your Meditation Audios and read or download your eBooks on this page while you are waiting for the DVD's to arrive. In order to start the process of health, healing and transformation, we start with the mind, clearing it through meditation for optimal thinking and decision making. Once you have clarity, it will be much easier to set goals and follow through. If you have a pair of headphones, they will enhance your audio experience. If not, just listen with your speakers and turn up the sound. Here are your Bonus MP3 Meditation Audios. This first audio is your Introduction to Meditation. It will give you some exposure to the fundamentals of meditation. This is not an in-depth course, but will give you a good overview of meditation and its purpose. This audio will give you some of the finer points about Breath Awareness Meditation (the particular meditation that we will be experiencing) and will give you an idea of what to expect. Breath Awareness Meditation. This audio will now take you into your meditation. I will guide you gently into focusing on the breath. You will meditate in silence for about 30 minutes. After 30 minutes, I will bring you back to your awareness of your surroundings. I have purposely lowered the volume at the end where I bring you back into awareness to keep it gentle. When the meditation is over, sit quietly for a few moments before getting up. Try not to judge the process, just let whatever happens, happen. In time, you will be going into your silent space with ease. If you live in a very noisy place, you can try using earplugs. They work very well in filtering out noise. Just use a timer if you use earplugs because you won't hear me bringing you out of your meditation. Left-click any of the links below to bring that particular eBook up on your page, or right-click to download it to your computer. If you decide to download the eBooks to your computer, you will need Adobe Reader (the latest version is recommended) installed on your computer in order to open and read this eBook. You can get Adobe Reader here (a new window will open so you can download it without leaving this page). If you want to open the file in your browser window, just click on the link. However, if you want to download the file to view later, then right-click on the link and choose "Save Target As" or "Save File As." Then select where you want to save the file on your hard drive. Once you have saved the file, locate where you saved it, and double click to open. In order to print, open the downloaded file, and select the "Print" option from the ebook menu. 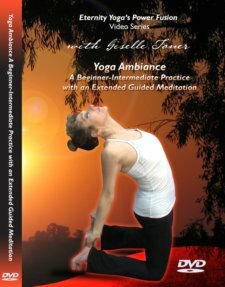 This eBook will help the beginner as well as seasoned yoga practitioners and gives basic facts on what yoga is and what yoga is not. Sometimes, information on yoga is conflicting and confusing. This eBook sorts out misleading information and makes the fundamentals clear. If you are curious as to whether or not becoming a Vegetarian is for you, this compelling eBook will give you all the necessary information as well as some recipes to get you started. Even those who do not wish to become a Vegetarian will benefit from this information. This informative eBook will give you information on a number of health and wellness topics and gives a broad view of wellness with tips and important information for everyone. Please feel free to Contact Me With Any Questions by Clicking This Link.